Amielle C. wishes to remind everyone that Wheat and Laurel, her literary journal for rural Alberta youth ages 11-19, is having its first issue launch party at the Camrose Public Library Sunday, April 14th, 2019 from 2:00pm – 5:00pm. Please attend if you are able. Lucas H. nominated by Gus B. to be Secretary. The motion was seconded by Margaret H. The motion was passed. Congratulations to Lucas H. as our new secretary. The Treasurer position is still open. Margaret H. will continue being the banker until the Treasurer position is filled. Margaret would like to point out that she is retiring in May of 2020, at which point priorities could change. The position description of each leadership team position can be found in our bylaws, which can be found with Margaret H. She will make the bylaws available to everybody. Note: we are hoping bylaws and other documents can be readily available to all and request those with documents make it known to Margaret, including electronic documents. Margaret H., our banker, will be away from May 27th, 2019 to July 7th, 2019, at which point funds will be out of reach. This is during our Pride BBQ and preparations for our parade float. Revenue includes $500 from CDSS and a net profit of $576 from the Ages and Stages Dance at the end of March after ~$600 of expenses from the $1,228 gross revenue. The Nordley’s Coat Check fundraising brought us $870, including the tips from the bar staff. Many thanks go out to them for supporting Pride Camrose. Some expenses incurred were paid out of gross, of which we received the net. Gus B. is still working towards our society designation with the Government of Alberta. Unfortunately, they had mis-typed his e-mail address last year and he never received the information he needed to move forward with the society designation, so the application had to be restarted in February. Thank you to Carol and Margaret H. for starting that process. While this does set things back, it does give us more opportunity to understand what we will need when we receive society status, including what positions will be needed to add to the executive team or the possibility of additional directors. This positions will need to be defined for our society status. We would like to receive more information about society and board status with the government Alberta. For instance, are we able to open a bank account without being a designated society? We are hoping someone will take up the mantle on finding that information from various banks around Camrose. We will contact the Alberta Government about our status after elections, which have paused a lot of government services. Currently items are stored at Gus B. Salon. Unfortunately, that space will no longer be accessible soon, due to the business being sold and moved. Robyn G. has graciously offered us space in her home. Her space will be available after April 25th, 2019. There are about 4 shelves of items. Nikki F. has possession of most of the electronic documents relating to the Camrose Pride Community, including flash drives. The price has been dependent on advertising cost and how much volunteer effort was put into raising donations. In the previous years Rebecca has been very active in receiving donations, of which there were considerable last year. She also donated much herself last year. We would like to have a call out for volunteers who can go out and ask for donations. There was also much spent last year on decorative items and supplies that won’t need to be repurchased this year. In order to preapprove spending for auditor purposes, Gus B. raised motion to approve petty cash spending up to $500 for the BBQ. Stephen seconds the motion. The motion is passed. Nikki with the CDSS can issue cheques with this preapproval. The BBQ follows Edmonton Pride Week, which may provide some advertising opportunities. Unfortunately Amielle and Margaret will be away, and Gus B. cannot commit to a Saturday. We have moved the date of the BBQ to Sunday, June 16th, 2019 instead. Details will come. Nikki F. will head the BBQ Subcommittee with AltView. What will be involved with the planning committee? We will ask Rebecca was she is willing and able to do. The event will take place in a city park, which is City of Camrose property, therefore we will need to apply to hold a special event there. This application should be made by May 15th at the absolute latest. Nikki F. can most likely apply for park use and be the liaison with the City of Camrose. Home Hardware has a community BBQ can that be used free-of-charge. They will also deliver and pick-up the BBQ. Gus B. will call Home Hardware to book the BBQ for June 16th. We will send out calls for a volunteer cook – Camrose Police? We will need certification with Alberta Health Services. We will need someone to decorate with balloons, streamers, etc. We will need someone responsible for advertising. We have last year’s poster and with updates it could be submitted to Camrose Morning News, The Centracam Poster should go up at the end of May. CDSS may be able to help with advertising. The majority of the work can be done in May for preparations. Nikki F. will also ask around about information pertaining to a BBQ, especially with the police, as they recently had a BBQ. 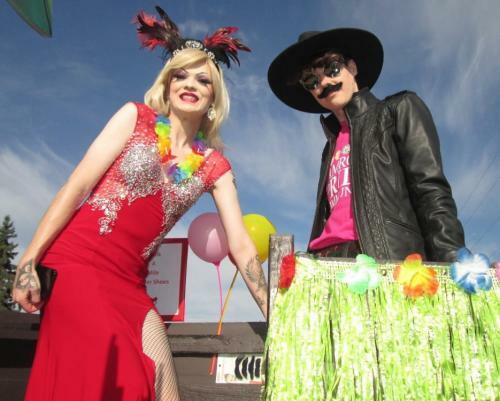 The Pride Parade will be the first weekend of August, during the Big Valley Jamboree on Sunday, August 4th, 2019. Gus B. motions to approve $500 petty cash for Pride Parade. Stephen seconds the motion. The motion is passed. Last year we had success with borrowing Trish’s convertible for the float. It was driven by Dale. We will need a Driver’s License and Insurance. Note: it is not an easy car to drive. Robyn Banks had walked with us last year: would she like to participate again this year? Would Melissa like to walk with us as Sir Racha? Shall we extend the invitation for all to dress in drag if they are comfortable? We willneed a clipboard with a waiver to cover the insurance. We will also need more information about the rules involved. CDSS can help us apply with the Chamber of Commerce and cover for WCB. Amielle will call the Chamber of Commerce for more information about this. Organization will be charged by Amielle and assisted by Nikki F.
We have many rainbow pompoms from the previous year. The symposium was a day-long event at the Chapel at Augustana with keynote speakers Gary Wellson and Marie Parnas, and included talks on How to Be a Better Ally and How to Deal with Bigotry. It was well attended with about 40 guests, most of whom were students, though University administrators did attend as well. We are hoping to have another next year with even more success, including with new keynote speakers who may provide new insight for the LGBTQ+ community. Unfortunately, information collected at the Symposium, including the e-mail addresses of people that want updates from the CPC have been lost. We are hoping to inquire to get them from the UofA. It went really well, although perhaps in the future we will not combine an under 18 with an over 18 event. It is better to keep these as two separate entities on two separate days, as most people were too tired to take part in anything occurring after 10:00 pm, with attendance dropping to about 5. The silent auction should be in a more obvious and accessible place to encourage more donations. In future events, perhaps we can involve all three LGBTQ+ organizations (CPC, AltView, AQUA) more heavily to encourage stronger attendance. In the future we would like more emphasis on the dance, instead of the cabaret aspects. The considerable amount of performances did not engage children as well as free dancing. Hiring a DJ is recommended for future dances. Rates are reasonable. Retro may not be the best venue for an event like this. Perhaps the Bailey or Elk Hall would be more appropriate in the future. In the future, over 18 events could occur in tandem with AQUA. Perhaps an event a semester would work well. Gus b. Will ask Sarah from Camrose Coffee about hosting us again this month. This event is for the parents, family, and friends of LGBTQ+ individuals. Meeting agenda will be made by Nikki F.
The meeting was chaired by Gus. Wayne sent his regrets. 17 people were in attendance (at different times or on the phone) during the meeting. Camrose Police Service representatives and City of Camrose Strategic planners were in attendance to ask for our honest feedback on what they are doing well and how they can improve in the future. What aspects of public safety and policing are going well in Camrose? What areas of concern could be improved and/or use increased attention from police and the community? There was good discussion in the group, but concern was expressed that there are voices in the LGBTQ2S+ Community that are not being heard. Camrose Police Services urges anyone who has anything to share with them either positive or negative, to submit responses to police@camrose.ca at any time. If people wish to submit them anonymously, they may email camrosepridecommunity@gmail.com and Camrose Pride Community will not reveal the person’s identity when their comments are shared. a. Janet shared that the Walkable Camrose Committee has been discussing the possibility of engaging various groups, like Camrose Pride Community, in something called tactical urbanism. These would be peaceful, non-permanent changes to the environment that could draw attention to a situation that the group would like to change. b. Janet shared a number of images of examples such as temporary art expressions on streets or in parks. The group was particularly interested in painting the rainbow crosswalks. c. There was discussion about how, when and where this might be possible. a. Jane shared three opportunities to become involved with various events in Camrose in the upcoming months. Potential partners are invited to a meeting on March 15 at 1:30 pm at the Arts Centre to present their ideas and a budget that could potentially be added to a grant application. Nikki will explore this possibility. b. Jane also mentioned that there is also the potential of combining the tactical urbanism with some of the Arts Centre events. This will be explored and discussed further, but requires people to take leadership roles. 5. Margaret shared the Treasurer’s report. a. There is approximately $1500 that is undesignated presently. b. There was discussion about how the group needs to be conscious of financial and human resources moving forward since Jen and Carol will no longer be providing leadership support. This needs to be taken into consideration when considering upcoming events. c. Good news was shared that Nikki Featherstone has been hired by altView to support the work of Camrose Pride Community (the vacancy created when Jen moved). Nikki will have approximately 10 hours per week to provide this support. There will be a need for others to step forward to offer leadership in various areas that the group needs. This will be discussed more fully at the next meeting. b. March 23 All Ages and Stages Dance and Cabaret at Retro 7-10 p.m. (all ages) and 10 pm- closing (adults only) Advance tickets can be purchased at Retro and Quantum Comics and at the door (space is limited). c.BBQ in June? Planning committee? i. Nikki offered to head up a planning committee. ii. More committee members are needed. Please let us know if you can help. d. Big Valley Jamboree Parade in August? Planning committee? i. Amielle offered to assist with the parade planning. a. There was limited time for discussion, but the general tone of feedback was positive about the variety of events and times they were offered during the week. So You Think You Can Drag continues to grow and be a very popular event in the community. a. espressOUT on March 25 5:30-7:00 p.m. at Camrose Coffee on main street next to Bellissima Fashions (across the street from Camrose United Church). This is a new coffee shop in Camrose that is very happy to host the espressOUT conversation group. b. Friends and Family Meeting at the Camrose Public Library in the Bunker on the first Monday of the month (April 1) 6-8 p.m.
c. The Traveling Tickle Trunk education event and sale has been rescheduled to April 1. It was postponed during Pride Week due to the illness of the presenter. Details will be announced shortly. d. Regular Meeting for Planning and Connection at the Camrose Public Library in the Bunker on the second Monday of the month (April 8) 6-8 p.m.
*Nikki will assist the Leadership Team with the creation of an agenda for this meeting and Amielle will record meeting notes. A delicious and beautiful cake decorated with rainbow colours and the Pride Flag was shared to acknowledge Carol’s leaving. She was presented with a card and words of thanks. Michael Green of altView gave an excellent presentation that was very informative and helpful. This emphasized that importance of providing an opportunity for people to express their concerns and have them addressed with accurate information. Boris Rybalka, GM and Head Coach of the Kodiaks, was very welcoming and did a lot to highlight inclusion in sports at the game. Thanks to the Kodiaks for their support and to Jeff McLean of Pride Tape. Consensus to try Fika as a location for espressOUT in January. Action: Melissa will contact Fika about possibility for having espressOUT at Fika on January 28. Action: Carol will send information to Alex of the ASA to see if the notice can be included in the Wellness Week activity schedule. Spread the word that all friends and family are welcome to attend. We will meet at Gus’ house at 6:00 p.m. Contact Camrose Pride for the address. We still need to find a suitable movie to watch. Suggestions? The Camrose Police Association gave Camrose Pride a $1000 grant to run the project. It will be open to queer youth (up to the age of 24) in Camrose and area on January 11, 18 and 25 at the Boys and Girls Club in the Community Centre from 6-8 p.m. Youth will have the option to include their creations in a Queer Like Me Art Exhibition at the Camrose Public Library. The Gala opening of the exhibit will be on Thursday, February 28 during Pride Week. Information will be sent out about this project before the end of November. Action: Carol will contact the Nordlys organizers. Good possibility that there will be some Community Service Learning Students who will be able to help with Pride Week activities and a community safe spaces initiative starting in February 2019. Many exciting ideas for Pride Week were shared by Melissa, Carol and Cathie. Melissa and Carol will try to coordinate the various committees for planning a fantastic Pride Week. Cathie has a theatrical friend from Halifax who is willing to do live Karaoke of cabaret songs with the attendees. Action: The event organizers will request that Robyn Bank$ also perform that night as well as other local drag kings and queens. A committee to plan this event is being formed. The group had many ideas for speakers and topics. AQUA has invited Camrose Pride Community members to a movie night in the Wahkohtowin Lodge Classroom at Augustana on Thursday, November 29 at 7:00 p.m. to watch the movie “Love, Simon”. Food and snacks will be provided. Carol will be retiring from her position with Camrose Pride Community in mid-March. Action: If anyone is interested in taking on the role of Secretary for Camrose Pride Community, contact the Leadership Team to discuss this responsibility. There have been some requests for activities for youth in the community who are in the 12-19 year old range. Discussion and brainstorming generated ideas like collaborating with About Time Productions and/or Camrose Public Library to offer some activities and opportunities to connect with other youth. This might be possible on Friday afternoons when there is early dismissal from high schools. Concern was expressed that there is a lot of misinformation around transgender issues that would be a good topic to address with a presentation in the community and at Augustana. Click link to access notes! Action items are in purple. Carol shared some resources from Mental Health Awareness Week about using nature to assist with mental health. We will attempt to be very conscious of people’s privacy and will not take photos or post photos without verbal or written consent. We will avoid taking and posting photos of minors without parental consent. Community BBQ on June 24, 2018 at House of Hair Design from 1-4 p.m.
Carol, Wayne and Amielle will be the planning committee for this event. It was suggested that we include sidewalk chalk, lawn games and music as part of the activities for the afternoon. Gus is consulting with Carl on the design for the float. TNeal and Shea are preparing the truck and trailer. Theia will be connecting with the Family School Liaison workers to see if some of them can assist in preparations for the float during the first week of July. Others are welcome to assist with this as well. Carol has assurances from a community member who is willing to provide garage space for the decorating and storing of the float prior to the parade. Margaret will register Camrose Pride Community for a table at Community Registration Night on September 6. Jen, TNeal and Shea are willing to provide information at the table; Amielle will help if she is available. Good Goat Books and Games has generously offered to host espressOUT in their newly opened business even though they are not open on Mondays. Each month at our Monthly meeting (the 1st Monday of the month), we will determine where to hold espressOUT for that month (on the 3rd Monday of the month). Discussion about partnering with the Augustana Pride Committee and Augustana Queers and Allies to hold a Family Dress Up Dance in October- Wayne and Carol will explore this. Discussion about having a campfire and wiener roast at the end of August or beginning of September-Amielle, Carol and Wayne will explore the possibilities. Mention of continuing our Holiday Potluck for our monthly meeting on December 3, 2018. Brief mention of planning some educational events in the fall as well e.g. safe spaces sensitivity workshop for businesses and service providers. Unfortunately, no one from Camrose Pride Community if available to participate in the Taber Pride Festival; discussion about sending some information to the organizers that could be shared; Wayne and Carol will respond to the request from Taber. The group was in favour of Camrose Pride Community hosting a community drum circle as part of the Arts and Recreation in the Park event on June 23; Carol will make arrangements to facilitate this on behalf of the group; information can be available to the public about Camrose Pride Community and about our community barbeque the next day. The Leadership Team is preparing the documents for Camrose Pride Community to become a Not for Profit Organization. The hope is that with this status, Camrose Pride can apply for grant funding. Please note that this has had to be postponed until September 28 (Orange Shirt Day). Ecole Camrose Composite High School GSA is hosting Pride Week activities at the school during the lunch time break from Monday, May 14-Thursday, May 17. Some Camrose Pride Community members were interested in supporting these initiatives. espressOUT on May 21: Meeting at House of Hair Design 5:30-7:00 p.m.
June 4 regular monthly meeting at House of Hair Design 6:00-8:00 p.m.
BBQ in the backyard of House of Hair Design (4830-48 Street) 1:00-4:00 p.m.
Let Jen know if you want to buy a shirt with the Camrose Pride Community logo on it. Family and Friends Support Group have determined they will be meeting on the fourth Monday of the month at Camrose Public Library 7:00-9:00 p.m. Next meeting is on Monday, April 23 at 7:00 p.m.
Camrose United Church Indigenous Book Club has invited Chevi Rabbitt to speak at their meeting on May 23. This is open to the public. More details to follow. 7 present; Gus chaired the meeting. Invite family and friends – spread the word! altView will be launching a new website to support parents in supporting their LGBTQ+ children; this has transpired out of their work with the Government on Bill 24! Way to go altView! The Google Calendar will be uploaded to the website. There is a new doctor in town at the Smith Clinic who is accepting new patients of all ages and sexual orientations! 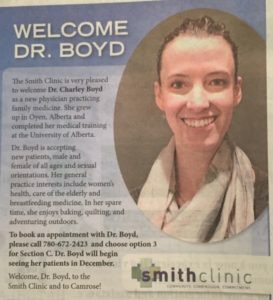 Dr. Charley Boyd is now practicing medicine in Camrose! Preregistration required – how are the numbers? Who would like to work on this planning committee? 5. Next regular connection and planning meeting on Monday, November 6 at Camrose United Church 6:00-8:00 p.m.